Dr. Carolyn Nessim's main research interests involve understanding the immunology of Soft Tissue Sarcoma and Melanoma. She collaborates with scientists at OHRI doing translational projects looking at the role of oncolytic viruses, NK cells and T-cells in the treatment strategies for Sarcoma, GIST and Melanoma/Merkel Cell Carcinoma (MCC). Of particular interest, is identifying biomarkers of response to treatment. She has a particular interest in the evaluation of Liposarcomas as well as Unknown Primary Melanomas. She also leads and collaborates on many clinical research projects evaluating the treatment of Sarcoma/GIST and Melanoma/MCC. She is a member of the Trans-Atlantic Retro-Peritoneal Sarcoma Working Group (TARPSWG) and Global Melanoma Research Network (GMRN). She is also an active member of the Ontario Cancer Research Ethics Board (OCREB) and the Canadian Cancer Trials Group (CCTG). Dr. Carolyn Nessim is a Surgical Oncologist at the Ottawa Hospital and Assistant Professor of Surgery at the University of Ottawa. She completed her MD, MSc (Biomedical Sciences) and General Surgery Residency at the University of Montreal. Her fellowship training was in Surgical Oncology at the University of Toronto and then at the Peter MacCallum Cancer Center in Melbourne Australia. 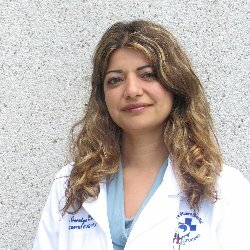 She is currently also a Clinician Investigator in the Cancer Therapeutics Program at The Ottawa Hospital Research Institute (OHRI) as well as the Program Director for the Complex Surgical Oncology Subspecialty Fellowship training program. Her clinical practice focuses on the treatment of patients with Soft Tissue Sarcoma/GIST, Melanoma/Skin Cancers, Gastric cancer and Neuroendocrine Tumours. She is the Regional Lead for Melanoma and Skin Cancers and Co-Lead for Gastric Cancer and Sarcoma in the Champlain LHIN. She has been invited as a speaker and moderator at several national and international conferences on the topics of Sarcoma and Melanoma. Crawford, Nessim C, Weaver J, van Walraven C. Wait times for melanoma surgery: Is there an association with overall survival? Ann Surg Oncol 2017; 25(1): 265-270. doi. 10.1245/s10434-017-6146-2. Zhang Y, Cordeiro E, Seely J, Hefler J, Gravel D, Smylie J, Aro J, Nessim C. Radioactive Seed Localization vs. Wire-Guided Localization for non-palpable breast cancer: a Cost and OR efficiency analysis. Ann Surg Oncol 2017; 24(12): 3567-3573. doi. 10.1245/s10434-017-6084-z. Ambacher K, Ibrahim A, Nessim C. Ensuring a Safe and Qualitative Diagnostic Biopsy for Retroperitoneal Sarcomas. UOJM 2017; 7(1): 45-48. Lim R, Kielar AZ, El-Maraghi RH, Fraser MA, Nessim C and Thipphavong S. Multidisciplinary Retroperitoneal and Pelvic Soft Tissue Sarcoma Case Conferences: The Added Value Radiologists Can Provide. Current Oncology 2017; 24(3): 171-175. DOI: https://doi.org/10.3747/co.24.3478. Head L, Nessim C, Boyd KU. Innovative model to optimize resource utilization and improve access to care for high-risk/BRCA+ breast cancer patients. Can J Surg 2016; 59(6):10.1503/cjs.001116 (Epub ahead of print). Can J Surg 2017; 60(1): 37-44. Nessim C, Ferguson P, Gupta A, Catton C, Gladdy R. Retroperitoneal and Extremity Soft Tissue Sarcoma. Chapter in the Toronto Surgical Oncology Manual 1st edition, published in April 2012. Nessim C, Govidarajan A, McCart A. Peritoneal Malignancies. Chapter in the Toronto Surgical Oncology Manual 1st edition, published in April 2012. Nessim C, Rotstein L, Goldstein D, Sun A, Hogg D, McCready D, Ghazarian D. Princess Margaret Hospital: Melanoma Guidelines, PMH website, June 2012.